The Hox family of transcription factors has a fundamental role in segmentation pathways and axial patterning of embryonic development and their clustered organization is linked with the regulatory mechanisms governing their coordinated expression along embryonic axes. Among chordates, of particular interest are the Hox paralogous genes in groups 1-4 since their expression is coupled to the control of regional identity in the anterior nervous system, where the highest structural diversity is observed. To investigate the degree of conservation in cis-regulatory components that form the basis of Hox expression in the anterior nervous system, we have used assays for transcriptional activity in ascidians and vertebrates to compare and contrast regulatory potential. We identified four regulatory sequences located near the CiHox1, CiHox2 and CiHox4 genes of the ascidian Ciona intestinalis which direct neural specific domains of expression. Using functional assays in Ciona and vertebrate embryos in combination with sequence analyses of enhancer fragments located in similar positions adjacent to Hox paralogy group genes, we compared the activity of these four Ciona cis-elements with a series of neural specific enhancers from the amphioxus Hox1-3 genes and from mouse Hox paralogous groups 1-4. This analysis revealed that Kreisler and Krox20 dependent enhancers critical in segmental regulation of the hindbrain appear to be specific for the vertebrate lineage. In contrast, neural enhancers that function as Hox response elements through the action of Hox/Pbx binding motifs have been conserved during chordate evolution. The functional assays reveal that these Hox response cis-elements are recognized by the regulatory components of different and extant species. Together, our results indicate that during chordate evolution, cis-elements dependent upon Hox/Pbx regulatory complexes, are responsible for key aspects of segmental Hox expression in neural tissue and appeared with urochordates after cephalochordate divergence. In all the animal species from insects to vertebrates Hox genes play a key role in determining anterio-posterior (AP) identities. The clustered organization and spatio-temporal colinearity of expression of Hox genes in many species are believed to be important for their functional roles . The availability of genomic sequences from an increasingly large number of species has shed light on many aspects of the evolution of Hox gene organization. However, this data has also opened new questions on the origin of Hox genes and on the mechanisms that controlled their evolution [2, 3]. A single set of Hox genes is present in all invertebrates and non-vertebrate chordates analysed so far. Two rounds (2N) of genome-wide duplication led to the formation of four Hox clusters seen in most vertebrates, while an additional (3N) round of duplication and divergence in ray finned fishes has led to seven or eight Hox clusters . Recent genomic analyses have demonstrated that only vertebrates have a compact and well organized Hox cluster, while most of the other chordates and invertebrates analysed so far have "an intact but disorganized, a split or an atomized cluster" with a highly variable gene number . Echinoderms have a single Hox cluster that has undergone significant rearrangements of the member gene positions. The sequencing of the genome of Strongylocentrotus purpuratus revealed a large Hox cluster with eleven genes that have undergone rearrangements of transcriptional orientation and gene order. The Hox5 gene is the most 3' gene and the Hox1-3 lie near the members of the cluster expressed in posterior regions . The cephalochordate amphioxus has a single and intact cluster quite similar to compact vertebrate organization and the Hox1, 2, 3, 4 and 6 genes show both temporal and spatial colinearity of expression along the anteroposterior axis of the developing neural tube [5, 6]. Nevertheless, there has been a further expansion of the 5' genes generating a total of fifteen paralogous groups [7–9]. Urochordates have nine Hox genes and both the larvacean Oikopleura dioica and the ascidian Ciona intestinalis species have lost Hox genes of the central paralogous groups [10–12]. It has been suggested that rapid embryogenesis and a simplification in body organization are at the basis of the breakdown of central Hox genes in these organisms. Oikopleura has completely lost the clustered organization of Hox genes while still maintains some anteroposterior colinearity in the notochord, neural tube, tail muscle and epidermis . In Ciona, only some of the nine Hox genes correspond to the Oikopleura complements and they are located on two chromosomes and interspersed with many other unrelated genes. There is no evidence for temporal colinearity, however spatial colinearity is partially maintained . In particular, CiHox1, CiHox3, CiHox10, CiHox5 and CiHox12 exhibit a spatially coordinated and restricted pattern of expression along AP axis of the central nervous system at the level of the visceral ganglion and nerve cord, which are considered homologous to vertebrate hindbrain and spinal cord respectively [13–16]. The other Ciona Hox genes (CiHox2, CiHox4 and CiHox13) appear to have lost their function in development of the nervous system and are associated the roles in other tissues such as mesenchyme. The Ciona Hox2 gene, unlike its vertebrate counterparts, has lost any evidence of spatio-temporal colinearity and is expressed only at the larva stage, in trunk lateral cells . Both ascidians and amphioxus lack a segmented hindbrain but the restricted expression patterns of anterior Hox genes and of other molecular markers show clear homologies with vertebrates in nervous system patterning [6, 13–15]. Vertebrate Hox genes exert a fundamental role in hindbrain formation and segmentation [17, 18]. They show sharp and nested anterior limits in the rhombencephalon and each Hox gene has a specific and different expression profile . These expression profiles are temporally and spatially defined through the combined action of different regulatory elements. Regulatory studies in the vertebrate hindbrain have demonstrated that different combinations of cis-elements and regulatory components are used to establish and maintain segmental Hox expression domains during development. Trying to understand which of the cis-regulatory modules that control and modulate Hox genes expression may be common to all chordates and which ones appeared only in specific lineages represents an interesting challenge. Gene duplication and divergence provides an opportunity to acquire new genetic material that during evolution will permit diversification and appearance of new structures. All chordates are characterized by the same body plan with a dorsal hollow neural tube, a notochord and lateral muscles but the very rudimentary cephalic structures typical of protochordates evolved and led to the appearance of a considerable number of innovations in vertebrates. Vertebrates unlike the other chordates are characterized by the neural crest, placodes and a complex brain . Hox genes played a key role in the morphological evolution of these structures. They control the correct segmentation patterning of these structures and define their antero-posterior identity. From an evolutionary point of view, the duplication and subsequent divergence of Hox genes are believed to have contributed to the formation of the vertebrate innovations. In particular, changes in gene regulatory regions are considered a driving force for the evolution of more complex body plan structures . Studies by phylogenetic footprinting have identified conserved noncoding regions but often large phylogenetic distances make it difficult to establish the real significance of the results obtained. The sequencing of the Hox cluster of the european amphioxus Branchiostoma lanceolatum and its comparison with the other clusters of the amphioxus Branchiostoma floridae and vertebrates permitted, at least in part, to overcome the phylogenetic distances and to identify several putative regulatory regions [8, 21]. Nonetheless, further characterization of these sequences will be necessary to establish their biological significance. Amphioxus Hox1-3 regulatory elements tested in mouse and chicken embryos revealed the presence of conserved neural elements adjacent to the AmphiHox1 and AmphiHox3 genes dependent upon retinoic signalling for activity [22, 23]. These control regions contained retinoic acid response elements (RAREs) of the DR5-type located at the 3' end of AmphiHox1 and at the 5' end of AmphiHox3 which are responsible for expression of these genes in vertebrate neural crest and neural tube from rhombomere 6 to posterior without any specific segmentation [22, 23]. This is consistent with data showing that the endogenous AmphiHox1 and AmphiHox3 genes respond to retinoic acid [5, 24, 25]. Retinoic acid excess directly induces altered expression of these genes in gastrula embryos . Furthermore, these results also demonstrated that AmphiHox1, like its vertebrate counterparts Hoxa1 and Hoxb1, is a direct target of retinoid signalling in the nervous system [5, 24]. Among chordates, the sensitivity to retinoic acid seems to be less conserved in urochordates. The larvacean Oikopleura lacks genes of the retinoic acid pathway and does not show any homeotic posteriorization after RA treatment . In the ascidian Ciona intestinalis, only CiHox1 clearly responds to exogenous retinoic acid and it has an RA responsive element for its epidermal expression but it seems to lack RAREs at its 3' end controlling neural expression [22, 27–29]. Regulatory and mutational analyses in mice and other vertebrate species have shown that Krox20 and Kreisler transcription factors play crucial roles in the process of hindbrain segmentation by regulating rhombomere (r)-specific expression of the Hoxa2, Hoxa3, Hoxb2 and Hoxb3 genes [17, 30–33]. However, regulatory analyses of the AmphiHox1-3 loci suggests that Krox20 and Kreisler dependent neural elements have not been conserved in amphioxus . Previous studies on the Ciona CiHox3 gene and its neural specific regulatory element(s) revealed a similar divergence of Krox20 and Kreisler-dependent Hox3 control elements between vertebrates and ascidians, but showed that a certain degree of conservation exists with respect to Hox response elements capable of mediating auto- or cross-regulatory inputs from Hox genes . This is interesting because in vertebrates, following initial activation by transient inputs from retinoids, Krox20 and/or Kreisler, the segmental expression of Hoxb1, Hoxb2, Hoxa2 and Hoxa3 are maintained through separate cis-modules by positive auto- and cross-regulatory loops, that involve interactions between Hox proteins and the Meis/Prep and Pbx co-factors. For example, the murine Hoxa3 and Hoxb3 genes are first activated in r5 and r6 under the control of an enhancer with conserved Kreisler binding sites [31, 32], while in later stages only Hoxa3 is maintained in r5 through an auto-regulatory loop dependent upon conserved Hox/PBC sites . Similarly, following activation of Hoxa1 and Hoxb1 by retinoids, the expression of Hoxb1, Hoxb2 and Hoxa2 in r4 is achieved by a series of auto- and cross-regulatory enhancers under the control of dimeric and trimeric Hox/Pbx/Prep complexes [34–37]. 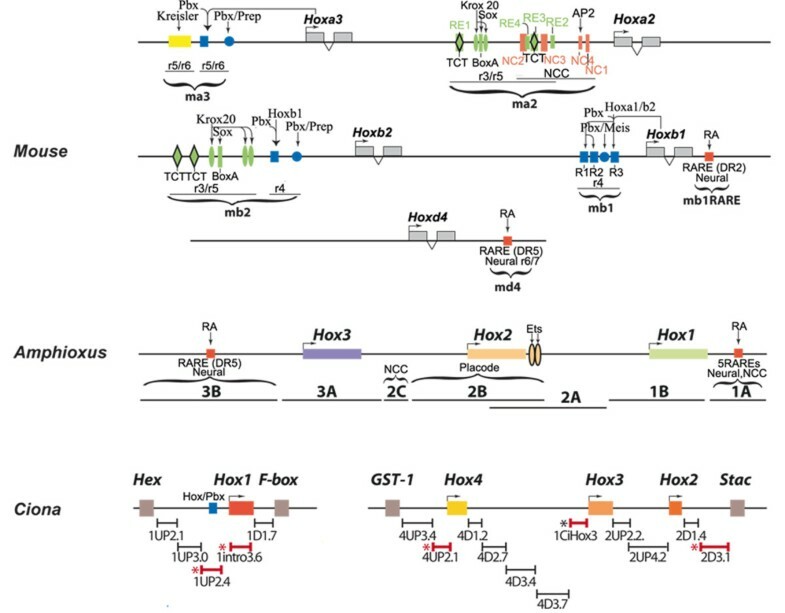 These studies illustrate that auto-and cross-regulatory inputs from Hox genes themselves are an important component of Hox regulation. To investigate how cis-regulation of Hox genes changed and evolved in the chordate lineage, we have used regulatory analyses in Ciona and vertebrates to analyse and compare various Hox regulatory regions of three chordate species, amphioxus, ascidian and mouse. In particular, we focused our attention on the elements controlling anterior Hox genes expression in the nervous system because the CNS is the territory where major structural differences can be observed in these chordate organisms and it is also the only one where anterior Hox genes of all three species are expressed during embryonic development. We identified several new control regions in Ciona and our results indicate that during chordate evolution, cis-elements dependent upon Hox/Pbx regulatory complexes, are responsible for key aspects of segmental Hox expression in neural tissue and appeared with urochordate after cephalochordate divergence. However, segmental regulation in the vertebrate hindbrain mediated by factors such as Kreisler and Krox20 appears to be specific for the vertebrate lineage. To enable evolutionary comparisons to probe the degree of conservation of Hox regulatory elements directing anterior neural expression in mouse, amphioxus and Ciona we selected a series of Hox rhombomere-specific enhancer elements characterized in mouse embryos for their ability to specifically direct segmental expression of Hox genes in paralogous groups 1, 2, 3 or 4. In particular, we examined two Hoxb1, a Hoxb2, a Hoxa2, a Hoxa3 and a Hoxd4 enhancer. Each enhancer contains a different set of the Krox20, Kreisler, Pbx/Meis and RARE binding sites, whose characteristics are indicated in Figure 1[31, 35, 37–40]. Genomic organization of the mouse, amphioxus and Ciona anterior Hox regulatory elements assayed by transgenesis in Ciona or vertebrate embryos. Ciona positive regulatory fragments are evidenced by a red asterisk while the black asterisk indicates location of CiHox3 enhancer. All the Hox1, Hox2 and Hox3 amphioxus genomic fragments tested by Manzanares et al. in mouse and chicken embryos have been chosen as representative of anterior Hox genes regulatory elements of cephalochordates (Figure 1). We then needed to map and identify functional elements in Ciona. Towards this end we performed transcriptional assays to scan for fragments in and around Hox genes in paralogy groups 1-4 capable of directing reporter activity in Ciona embryos. We identified four cis-elements as described below (marked by red *, Figure 1). A genomic sequence of about 20 kb encompassing CiHox1 and the two non-Hox adjacent genes (Hex and Fox) was obtained from the JGI genome sequencing project of Ciona intestinalis  and was analysed by the Nix programme of the UK Human Genome mapping project (HGMP). The resulting CiHox1 gene structure was used to generate a series of five genomic fragments extending through the intergenic region downstream of Hex through CiHox1 to the start of Fox adjacent genes (Figure 1). The fragments were cloned into a reporter vector containing LacZ as reporter gene and CiHox3 0.2 as the basal promoter . These constructs were electroporated into Ciona embryos to identify putative CiHox1 enhancer elements with regulatory potential by staining for LacZ reporter gene expression in embryos at tailbud and larva stages. The genomic regions 1UP2.1, 1UP3.0 and 1D1.7 did not give any specific LacZ activation (data not shown). In contrast, fragments 1UP2.4 and 1intro3.6 appear to recapitulate the expression profiles of the endogenous CiHox1 gene (Figures 2A-F). In particular, endogenous CiHox1 is expressed in the epidermis and CNS at the junction between the trunk and the tail at tailbud stage (Figure 2E) and in the corresponding epidermis, visceral ganglion and anterior caudal neural tube at larva stage (Figure 2F). The construct 1UP2.4, extending from position -2924 to -573 at the 5' end of the gene, activates LacZ expression in the epidermis at the junction between the trunk and the tail at both tailbud and larva stages (Figures 2A, B) and recapitulates CiHox1 endogenous epidermal expression (Figures E, F). This construct also recapitulates CiHox1 expression in the corresponding CNS, at level of the visceral ganglion and anterior caudal neural tube, but only at larva stage (Figure 2B). There is a specific but ectopic domain of LacZ expression in the most anterior part of the CNS that can be observed at tailbud stage (Figure 2A) and in the sensory vesicle at larva stage (Figure 2B).The construct 1intro3.6, containing a genomic fragment encompassing the second intron of CiHox1 is responsible for early and late activation in the CNS, recapitulating endogenous CiHox1 neural expression at both tailbud and larva stages. In particular, its expression was observed in the dorsal nerve cord at the junction between the trunk and the tail at tailbud stage (Figure 2C) and in the visceral ganglion and anterior neural tube at larva stage (Figure 2D). At this stage, an ectopic signal was also visible in the sensory vesicle. 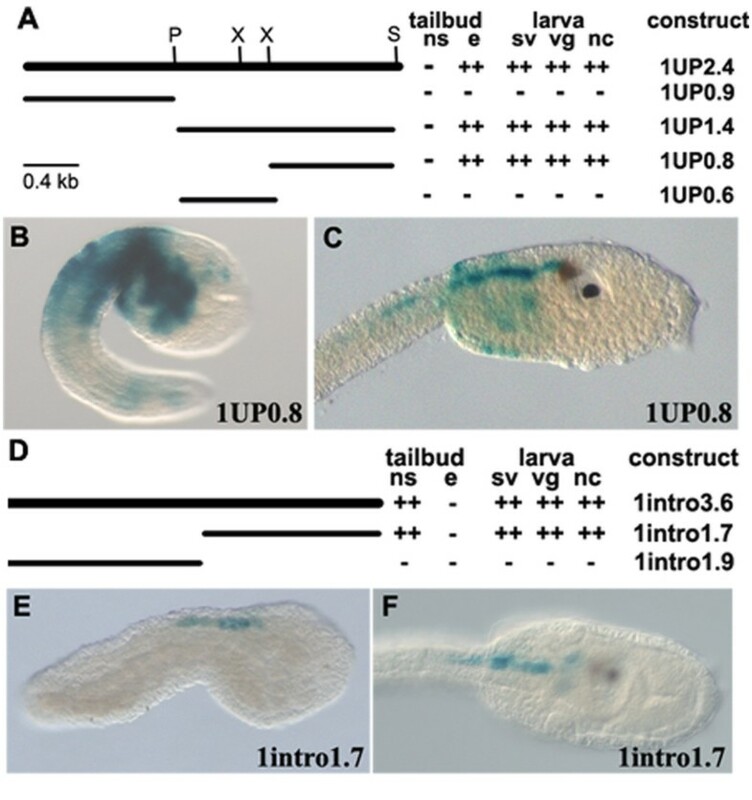 The analysis of a series of progressively deleted fragments of these two constructs (Figures 3A, D), identified a 0.8 kb DNA fragment (1UP0.8) able to activate reporter gene expression in the same territories of 1UP2.4 construct and specifically, in the epidermis of tailbud and larva embryos and in the CNS of larva embryos (Figures 3B, C). The second fragment of 1.7 kb (1intro1.7) reproduces 1intro3.6 construct and thus nervous specific CiHox1 expression at the junction between the trunk and the tail at both tailbud and larva stages (Figures 3E, F). 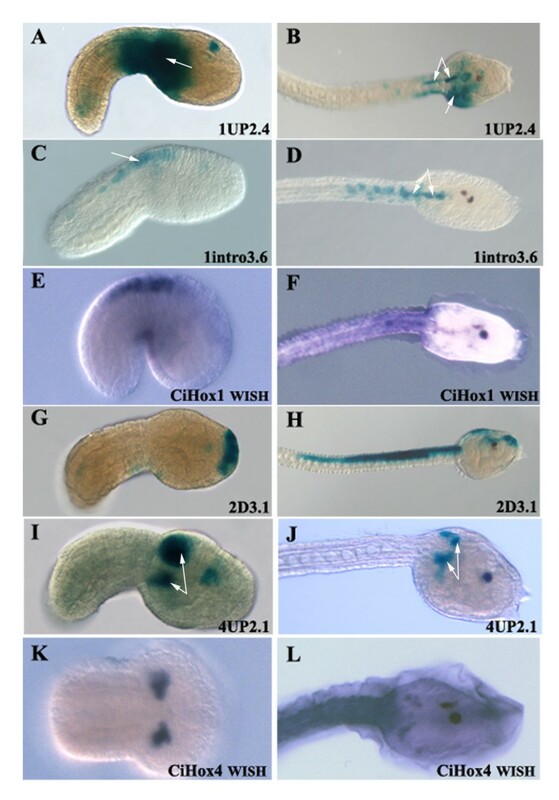 These results clearly indicate that the 1UP0.8 fragment, located 5' of the CiHox1 gene, contains the regulatory elements controlling its expression in the epidermis at tailbud and larva stages and in the CNS at level of visceral ganglion and anterior nerve cord only at larva stage. The genomic region of 1.7 kb located in the second intron of CiHox1 (1intro1.7) is responsible for both early and late activation of the CiHox1 gene in the nervous system. Expression territories of CiHox1, CiHox2 and CiHox4 positive cis-elements. A-D) LacZ expression of constructs 1UP2.4 and 1intro3.6 in electroporated embryos at tailbud and larva stages. E, F) CiHox1 endogenous expression profile by whole mount in situ hybridization at the same embryonic stages. LacZ and endogenous CiHox1 are both expressed in the epidermis and CNS between the trunk and the tail at tailbud (A, C, E) and larva (B, D, F) stages. Construct 1UP2.4 shows also ectopic expression in the sensory vesicle (A, B). G, H) Reporter gene expression of construct 2D3.1 in the future palps at tailbud stage (G) and in the palps, sensory vesicle at larva stage (H). I, J) LacZ expression of construct 4UP2.1 in the anterior CNS and mesenchymal pockets at tailbud (I) and only in the mesenchymal pockets at larva stage (J). K, L) whole mount in situ hybridization of CiHox4 gene in the mesenchymal pockets of embryos at the same developmental stages. White arrows indicate LacZ expression corresponding to the endogenous gene expression. Anterior is on the right and posterior on the left. All the embryos are on a dorsal view, except A, C and E that are on a lateral view. Summary of 1UP2.4 and 1intro3.6 deletion constructs and of their activity in transgenic Ciona embryos. A, D) On the left schematic representation of 1UP2.4 (A) or 1intro3.6 (D) constructs and their deleted constructs. The restriction sites used for the preparation of the transgenes are also indicated (P, PstI; S, SmaI; X, XbaI). Right side, constructs names and the tissues where the reporter gene is expressed. The number of crosses is indicative of days of staining. B, C) Expression of 1UP0.8 construct in the same territories of the endogenous CiHox1 gene in the epidermis of tailbud (B) and epidermis and CNS of larva embryos (C). E, F) Nervous specific expression of 1intro1.7 construct at tailbud (E) and larva (F) stages corresponding to endogenous neural expression of CiHox1. Anterior is on the right; B, C, E, lateral view; F, dorsal view. A genomic region encompassing the CiHox2, CiHox3 and CiHox4 genes was also analysed by using the same enhancer scanning strategy and reporter vectors adopted above for CiHox1. The ten fragments analysed lie between two adjacent non-Hox genes, and extend from the end of GST-1, located 5' of CiHox4, to the start of Stac, located 3' of CiHox2 (Figure 1). Previous analyses from our group examined the regions surrounding CiHox3 and identified an 80 bp element located at the 5' end of CiHox3 (indicated by an asterisk in Figure 1). This element is capable of mediating neural specific reporter expression  at level of the sensory vesicle and visceral ganglion (Table 1) and this last signal reproduces endogenous CiHox3 expression. Among the four genomic fragments of CiHox2 tested, only construct 2D3.1, located 3' of the gene, is able to activate reporter gene expression in the future palps of the embryo at tailbud stage (Figure 2G) and in the palps and CNS, at level of the sensory vesicle, at the larva stage (Figure 2H). This construct also activates reporter expression in tail muscles, but this pattern of staining is highly variable among the embryos and has been considered not specific. 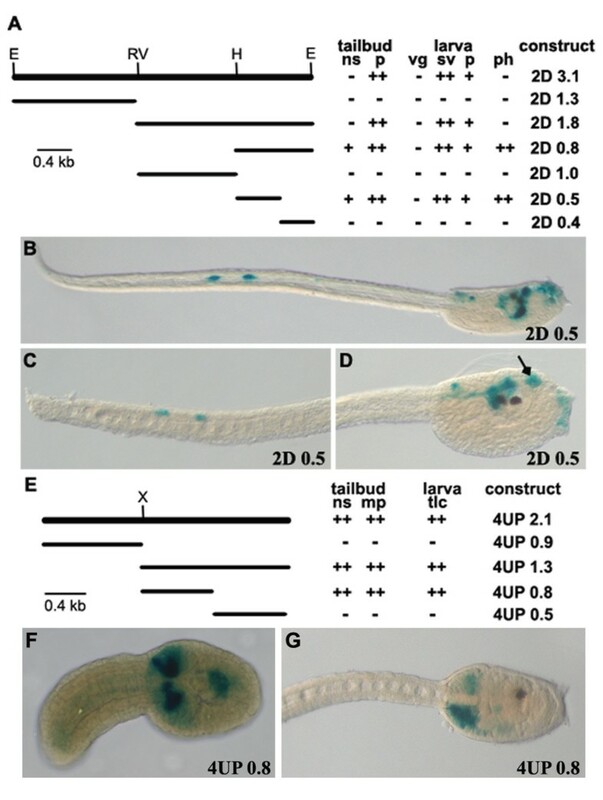 The expression profile of construct 2D3.1 does not recapitulate that of the endogenous CiHox2 gene, which is expressed only at larva stage in the trunk lateral cells . This suggests that additional fragments may work to restrict its activity or that these cis-elements located 3' of CiHox2 might function on the adjacent non-Hox Stac gene. To probe this latter possibility, we performed whole mount in situ hybridization experiments on embryos at tailbud and larva stages in order to establish Stac gene expression profiles. Stac is expressed in the epidermis at larva stage and is not expressed at tailbud stage (data not shown). Thus, Stac expression is completely different from that of CiHox2 gene and the pattern of reporter staining mediated by construct 2D3.1. To further investigate the regulatory potential of region 2D3.1, to specifically activate gene expression in the Ciona CNS we generated a deletion series (Figure 4A) and scored for reporter activity (Figures 4B-D). This analysis led to the identification of a 0.5 kb DNA fragment (2D0.5) which not only reproduces the expression profile of fragment 2D3.1 in the sensory vesicle and the palps, but also activates LacZ expression in the pharynx, the visceral ganglion (Figure 4D) and tail sensory neurons (TSN) (Figure 4C, Table 1). These results suggest that 2D3.1 contains an enhancer region capable of activating expression in neural and other tissues in combination with a repressor element that partially blocks its activity. Other repressor regions might reside in flanking regions of 2D3.1 and serve to further restrict the potential of the enhancer in generating the endogenous pattern of CiHox2 expression. Cis-regulatory activity of the 2D3.1 and 4UP2.1 deletion constructs. A) Schematic representation of 2D3.1 deleted fragments and of their expression in Ciona embryos at tailbud and larva stages. B) Construct 2D0.5 is active in the palps and sensory vesicle, as for construct 2D3.1, and also in the caudal sensory neurons (C), in the pharynx and visceral ganglion (D). E) Summary of 4UP2.1 deletion constructs and of their activity in transgenic Ciona embryos at tailbud and larva stages. F, G) 4UP 0.8 construct is expressed in the anterior CNS at tailbud stage (F) and in the mesenchymal pockets at both tailbud and larva stages (F, G). E, EcoRI; H, HindIII; RV, EcoRV; X, XbaI. To screen for the regulatory element(s) responsible for CiHox4 expression we tested six fragments, two located at the 5' end of the gene and four located at the 3' end (Figure 1). Of these regions, only 4UP2.1, located just upstream of the CiHox4 coding sequence, is able to activate LacZ expression. We observed staining specifically in the mesenchymal pockets (Figures 2I, J) which reproduces the CiHox4 expression profile at tailbud and larva stages, as revealed by in situ hybridization experiments (Figures 2K, L). Furthermore, this construct is also able to activate expression in the most anterior central nervous system at tailbud stage (Figure 2I). Deletion analysis of the sequence contained in construct 4UP2.1 has identified a 0.8 kb region (4UP0.8) responsible for this regulatory activity (Figure 4E). This 4UP0.8 fragment reproduces the expression profile of construct 4UP2.1 both in the anterior CNS and in the mesenchymal pockets at tailbud stage (Figure 4F) and only in the mesenchymal pockets at larva stage (Figure 4G). To begin our functional comparisons between Ciona, amphioxus and mouse, we first tested by electroporation in Ciona embryos all the amphioxus genomic fragments tested by Manzanares et al. in mouse and chicken embryos (Figure 1). We prepared a series of constructs containing the amphioxus 1A, 1B, 1C, 2A, 2B, 2C, 3A, 3B and 3C genomic elements, together with LacZ reporter vectors using either human β-globin or Ciona CiHox3 0.2  as basal promoters. These two basal promoters work both in Ciona embryos with the difference that the human β-globin is more efficient in gene activation but gives also more non-specific staining in the mesenchyme in comparison to the CiHox3 0.2 element (personal unpublished information). The majority of the amphioxus control regions, which function in mouse and chick embryos , do not display regulatory activity in Ciona. The only amphioxus element that gave a positive result in Ciona is construct 2B. This construct contains a 5.6 kb amphioxus genomic region encompassing the 5' end of Hox2, its coding region and part of its 3' end (Figure 1). As also reported by Wada et al. , this element leads at tailbud stage to the activation of LacZ in the most anterior part of the embryo in the precursors of the palps, sensory vesicle and pharynx (Figure 5A). We also observed expression in the notochord cells not previously reported. At larva stage construct 2B is specifically active in the corresponding anterior territories observed at tailbud stage (Figure 5C). We also observed in a high percentage of electroporated larvae a clear expression in the tail sensory neurons (Figure 5E). 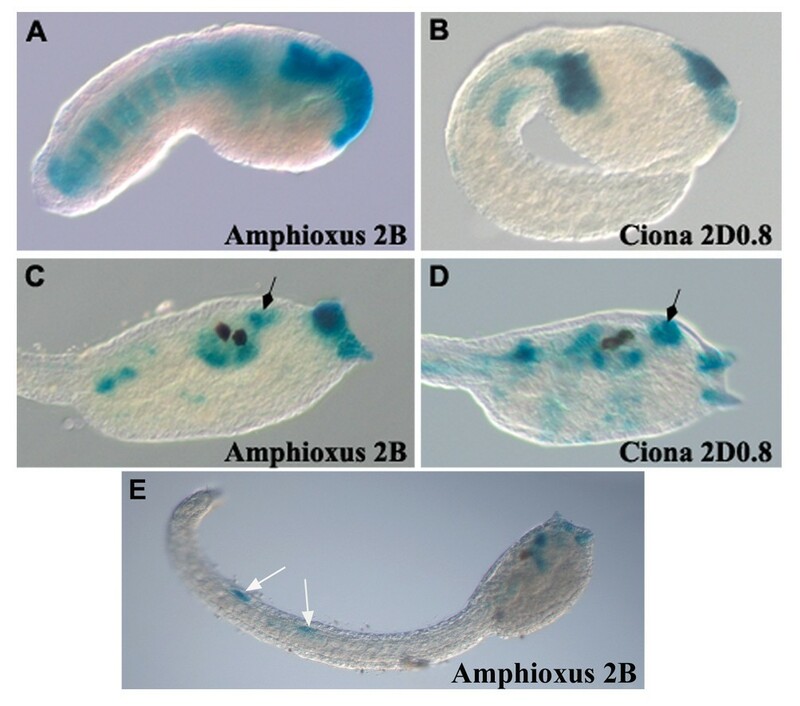 Analysis of the amphioxus 2B regulatory element in Ciona embryos. Expression mediated by amphioxus 2B element in anterior nervous system, pharynx (black arrow) and palps in tailbud (A) and larva (C) embryos is very similar to Ciona construct 2D0.8 expression at the same developmental stages (B, D). Amphioxus 2B is also active in notochord cells at tailbud stage (B) and in the tail sensory neurons at larva stage (E, white arrows). This expression profile of the amphioxus 2B element is very similar to that obtained with the Ciona 2D0.8 construct (Figures 5B, D). Constructs 2D0.8 and 2B at tailbud stage have similar activities in the palps precursors and anterior CNS (Figures 5A, B) and, at larva stage, both fragments are able to activate reporter gene expression in the palps, the pharynx and the sensory vesicle (Figures 5C, D). The amphioxus 2B fragment contains two Ets binding sites located at the 3' end of the amphioxus Hox2 gene that are responsible for its expression in these territories . It is interesting to note that the Ciona 2D0.8 fragment is located at the 3' end of the Hox2 gene, suggesting that these regulatory elements may be related and already present in the common ancestor to cephalochordates and urochordates. For sequence comparison of these two fragments see below the paragraph of "in silico analyses". Next we tested in Ciona embryos a series of Hox rhombomere-specific enhancer elements characterized in mouse embryos for their ability to specifically direct segmental expression of Hox genes of paralogous groups 1, 2, 3 or 4 and, as shown in Figure 1, containing a different set of the Krox20, Kreisler, Pbx/Meis and RARE binding sites [31, 35, 37–40]. Among these elements only two of them were capable of mediating reporter staining and only at the larva stage (Table 1). One, mb1 construct, is a 650 bp mouse Hoxb1 enhancer, located at the 5' end of the gene (Figure 1), which serves as a Hox response element through three cooperating repeats recognised by the Hox/Pbx complexes. In vertebrates, this Hoxb1 enhancer activates expression specifically in rhombomere 4 and its associated neural crest cells . In Ciona embryos, construct mb1 activates LacZ expression at larva stage in the posterior part of the sensory vesicle and in the most anterior part of the caudal neural tube (Figure 6A). This expression profile is very similar to that observed with the endogenous CiHox1 gene (Figure 6B) indicating that the mouse element recapitulates the major part of endogenous CiHox1 expression in the nervous system. Analysis of the mouse mb1 and ma3 regulatory elements in Ciona embryos. A) Lateral view of a transgenic Ciona embryo at larva stage showing mb1 expression in the sensory vesicle and anterior nerve cord. B) This latter territory (arrow) corresponds to that of the endogenous CiHox1 gene. C) Schematic representation of mouse ma3 deleted fragments and their corresponding activity. D) Lateral view of a transgenic larva electroporated with construct ma3, showing expression in a couple of tail sensory neurons. E) Transverse gelatin section at level of the tail sensory neuron marked by ma3. F) The mouse ma3P construct shows the same expression of the ma3 construct in the tail sensory neurons. The construct ma3 is also active in Ciona larvae (Table 1). It contains an enhancer located 5' of the mouse Hoxa3 gene with five binding motifs for Kreisler, Hox/Pbx and Prep/Meis complexes (Figure 6C) . 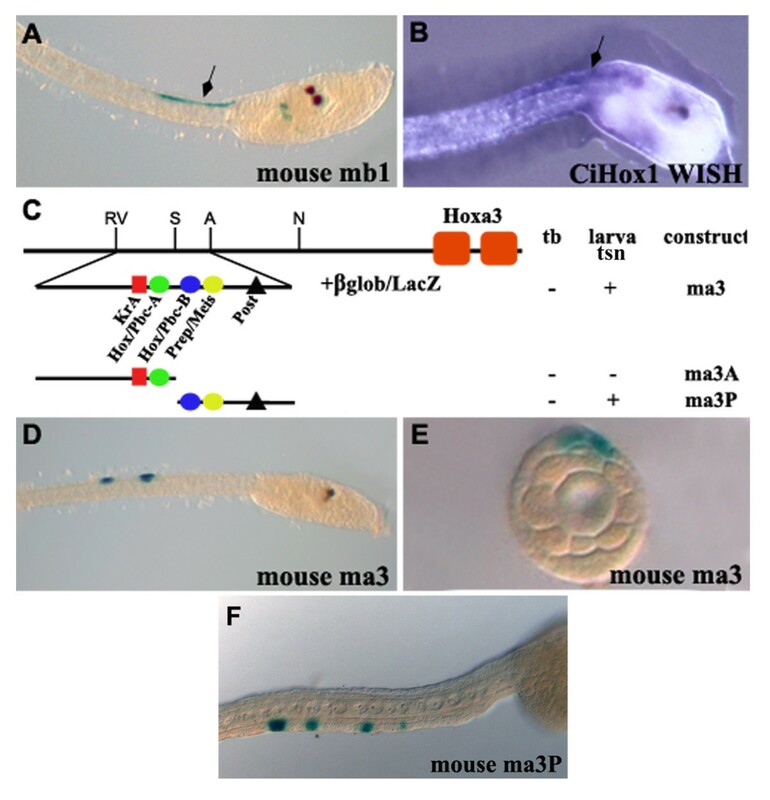 In Ciona embryos, the mouse Hoxa3 enhancer, activates reporter gene expression at larva stage in the peripheral nervous system and specifically in the tail sensory neurons (Figure 6D). A transversal section of an electroporated larva, clearly shows the position of the stained cell on the surface of the tail (Figure 6E). To determine which of the motifs are important for this activity, the ma3 regulatory sequence, has been subdivided into two smaller fragments (Figure 6C). The region ma3A contains the KreislerA site and a single Hox/Pbc-A motif, while the ma3P region contains the adjacent Hox/Pbc-B motif, the Prep/Meis and the posterior elements. Positive results have been obtained only following electroporation of the ma3P construct and it reproduces the results obtained with ma3 in the tail sensory neurons (Figure 6F). Thus, the Kreisler motif is not necessary for activity and the posterior element is the most probable candidate to explain this expression in caudal sensory neurons. Even though this profile does not recapitulate any typical Hox expression, it is to note that also the Ciona 2D0.5 and amphioxus 2B fragments are expressed in this territory. Again this result indicates the presence of conserved elements among the Hox genes of chordates. Looking for common binding sites, an in silico analysis of these sequences has been done, see below. To test whether the Ciona regulatory elements could function with vertebrate transcriptional machinery, the genomic fragments active in Ciona CNS and contained in the 1UP1.4, 1intro1.7, 2D0.8 and 4UP1.3 constructs were tested by electroporation in developing chicken embryos. A series of experiments using embryos at different stages of development revealed that constructs 2D0.8 and 4UP1.3 were not functionally active while 1UP1.4 and 1intro1.7 were able to direct LacZ reporter expression in chicken CNS. In particular, the 1UP1.4 fragment directed positive LacZ expression specifically in rhombomere 4 in chicken embryos at HH stage 8-10 (Figure 7A). This is interesting because enhancers from the mouse Hoxb1, Hoxb2 and Hoxa2 genes which are highly conserved in vertebrates and capable of directing reporter expression in an r4-restricted manner have been shown to serve as Hox response elements dependent upon the binding of Hox/Pbx and Meis complexes. Sequence analysis of the 1UP1.4 region indicated the presence of multiple Hox/Pbx and Meis consensus binding sites suggesting that it too might function as a Hox response element (see below the "in silico analyses" paragraph). Therefore, we tested the ability of the 1UP1.4 region to respond to ectopic expression of Hoxb1. As a positive control, in parallel we performed a similar trans-activation experiment using the mouse r4 enhancer region mb1, which was previously shown to contain Hoxb1/Pbx/meis elements responsible for directing expression in r4 (Figure 7C and ). We found that ectopic expression of Hoxb1 is able to expand reporter expression mediated by both 1UP1.4 and mb1 throughout the entire hindbrain (Figure 7B). This result indicates that the 1UP1.4 region contains a conserved Hox/Pbx regulatory element that mediates a response to group 1 Hox proteins. The activity of Ciona CiHox1 cis-elements in transgenic chicken embryos. A-B) Dorsal view of chicken embryos electroporated with 1UP1.4 construct with 1UP1.4 plus Hoxb1 expression constructs. 1UP1.4 activity is restricted to rhombomere 4 (A) and is expanded by Hoxb1 overexpression (B). C) As control, the mouse mb1 element is expressed in r4. D) Hoxb1 overexpression induces mb1 expanded activation in the whole hindbrain. E, F) Chicken embryos showing 1intro1.7 construct expression in the rhomboencephalon. F) 1intro1.7 activity is not influenced by Hoxb1 overexpression. The 1intro1.7 region was the other Ciona regulatory element active in the chicken hindbrain, but domains of expression were not rhombomere specific. As shown in Figure 7E, it is expressed in a variable manner along the whole rhomboencephalon but for the purpose of comparison with the 1UP1.4 region we tested its ability to mediate a Hox response. Ectopic expression of Hoxb1 did not induce changes in its patterns of reporter expression mediated by the 1intro1.7 region (Figure 7F). This suggests that the 1intro1.7 region contains an unknown but conserved specific regulatory potential which is not Hox/Pbx dependent and thus different from that of the 1UP1.4 DNA fragment. It could be a neural RARE element that Kanda et al. (2009) hypothesized be present in this genomic region . By using the Ciona, amphioxus and mouse regulatory sequences, we performed an in silico analysis to identify similarity with potential binding sites for known transcription factors included in the Transfac Professional Database 11.4 . In this analysis we considered the sequences listed in Table 1. In particular, we considered the Ciona 1UP1.4, 2D0.8 and 4UP1.3 and the mouse mb1 and ma3 sequences tested in this work, we also included the mouse mb2, ma2 and mb1RARE that did not show any expression in Ciona embryos and the CiHox3 fragment of 2.3 kb (1CiHox3), studied by Locascio et al. and active in Ciona sensory vesicle and visceral ganglion. We first determined the potential binding sites for different classes of transcription factors present in each sequence identifying similarity to varied consensus patterns belonging to each class. Then we identified those consensus sequences belonging to common classes of TF binding sites using an "in house" program to process the results obtained by the similarity search approach . In particular, we grouped these sequences on the basis of common expression profiles in Ciona or vertebrate embryos (Table 1). We compared all the sequences that are active in Ciona sensory vesicle (1UP1.4, 2D0.8, 1CiHox3, 4UP1.3 and the mouse mb1). The binding sites that are common to all of them have been extracted (see Additional File 1: Table S1). We, then, analyzed the other mouse regulatory sequences not active in the sensory vesicle for the presence of the same binding sites. As shown in Table 2 after grouping all the binding sites belonging to the same class of transcription factor, only four binding sites are common to all the genomic fragments active in the sensory vesicle (white background). Furthermore, GR, HSF and LEF-1 sites are also present in the other mouse sequences that are not active in Ciona sensory vesicle (grey background). The only binding site common to all the sequences expressed in the sensory vesicle, but not detected in the other regulatory elements is Pax6. Pax6 is a transcription factor expressed in the sensory vesicle of Ciona embryos but it does not seem to be involved in Hox gene regulation. It is possible that the position of the Pax6 binding sites in regions that exert primary roles in controlling the expression profile of these Hox genes has led to their conservation in Ciona and vertebrates. Ciona and mouse regulatory sequences active in the sensory vesicle (bold character) compared with the dataset not expressed in the sensory vesicle (light character). When analyzing the binding sites common to amphioxus 2B and Ciona 2D0.5 elements, we identified several Ets sites in the 2B sequence. However, these motifs were not detected in the 2D0.5 sequence when minimizing the error rates for both the false positive and the false negative matches. Therefore we reanalysed the 2D0.5 sequence using different parameter settings . In this case, the Ets binding sites were now detected in the 2D0.5 fragment but, the Ets identified on the 2B sequence do not correspond to the region characterized as functionally active . We then compared these two sequences considering non redundant patterns as parameter settings but, again, the patterns in the 2B sequence do not correspond to the functional Ets sites. These results suggest that non canonical Ets sites are present in the 2B sequence and that, despite the perfect coincidence of expression of the Ciona and amphioxus Hox2 genomic fragments, the low levels of sequence conservation do not permit the unambiguous identification of the corresponding functional sequence(s) in the Ciona 2D0.5 element. The expression of Ciona CiHox1 (1UP1.4) and CiHox3 (1CiHox3) regulatory sequences in rhombomere 4 of transgenic vertebrates reproduced the profile of Hox/Pbx regulatory complexes common to mouse mb1, mb2 and ma2 enhancers. We then, searched these Ciona sequences for possible Hox/Pbx/Meis binding sites and compared them with that of mouse r4 specific elements present in the mb1, mb2 and ma2 elements. We then, also analyzed and compared the regulatory sequences not specifically active in rhombomere 4 (see Additional File 2: Table S2). This analysis identified several conserved and significant binding sites. The majority of them are not specific for the sequences expressed in rhombomere 4, but are also present in the other sequences analyzed. Interestingly, as shown in Table 3 among all the Pbx and Meis binding sites identified, the Pbx and Pbx-1b (bold) could be of particular relevance. They are, in fact, responsible for mouse Hoxb1 specific expression in rhombomere 4 [35, 37] and are present in both the 1UP1.4 and 1CiHox3 sequences but are absent in the 1intro1.7 sequence that is not active in r4. With light characters are indicated the regulatory sequences that do not contain or do not show functionally active Pbx/Meis elements. Genome sequencing from a variety of vertebrate and invertebrate organisms revealed that the evolution of more complex structures is mostly due not only to the increase in gene numbers but also to the acquisition of novel regulatory circuits and as consequence of novel functions by preexisting genes . Under this view, the conservation or modification of cis-regulatory elements controlling genes that exert primary roles during embryonic development can help to explain how vertebrate innovations have been acquired. Of particular interest is to study the genes involved in the formation of anterior neural structures where the major differences can be observed between vertebrates and other chordates. Vertebrates are characterized by both morphologic and genetic key characters of the cephalic structures and try to understand the mechanisms that led to the evolution of these neural structures in the chordate lineage represents an intriguing challenge. We have compared neural specific regulatory elements of the anterior Hox genes from three different chordate species, the cephalochordate amphioxus, the urochordate Ciona intestinalis and the vertebrate mouse to begin to understand the mechanisms that led to the evolution of neural structures in the chordate lineage. In this study we have identified and characterized cis-regulatory regions implicated in controlling the neural expression of Ciona Hox genes from paralogous groups 1-4. Together with our previous work on CiHox3 , we find evidence for 5 regulatory regions that appear to recapitulate most of the endogenous expression patterns for CiHox1, CiHox3 and CiHox4 (Figures 1, 2) and are specifically active in the nervous system. We made direct comparisons of cis-regulatory regions from the Ciona, amphioxus and mouse Hox genes in paralogous groups 1-4 to explore the degree to which their cis-regulatory information has been conserved during evolution. We experimentally tested the ability of various anterior Hox regulatory elements from amphioxus and mouse to function in Ciona embryos and Ciona fragments to work in vertebrate embryos. This strategy permitted the identification of conserved sequences and apparently non conserved sequences that were able to elicit the same functions in different species. In addition, this functional comparison permitted the identification of regulatory regions that would have been impossible to identify only on the bases of sequence comparison. Our findings lead to several general observations that have interesting implications for understanding mechanisms that underlie the control of Hox expression in generating regional characteristics in the anterior nervous system. These issues will be discussed below. Cis-regulatory modules that receive input from transcription factors, such as Krox20 and Kreisler, play key roles in mediating segment-specific activation of Hox genes in the vertebrate hindbrain. These elements have not been identified by in silico analysis in Ciona and amphioxus Hox1-3 regulatory regions. Furthermore, the mouse Krox20 and Kreisler enhancers present in ma2, mb2 and ma3 fragments were not functionally active in Ciona embryos. The same situation occurred with the mouse Hoxa3 and Hoxb3 enhancers tested by Locascio et al. , where the Kreisler sites have not been recognized by the Ciona regulatory machinery. These results, together with the observation that amphioxus anterior Hox genomic fragments are not able to reproduce in mouse and chicken embryos any Kreisler or Krox specific expression profile , indicate that this mode of activating early Hox expression in the anterior CNS is not present in Ciona or amphioxus and is specific for the vertebrate lineage. It appears that Ciona, amphioxus and vertebrates utilize different sets of factors from each other to initiate or establish their early domains of Hox expression, which may reflect differences in their respective embryogenic processes. However, it is possible that there are some overlaps in the signalling pathways that directly initiate Hox expression or different upstream factors that in turn activate Hox expression in Ciona, amphioxus and vertebrates. For example, retinoid signalling directly activates vertebrate group 1 and group 4 Hox genes through RAREs positioned near the genes [40, 44–46], and AmphiHox1 contains RAREs that activate its expression [22, 23]. AmphiHox1, 2, 3 and 4 collinear expression in the CNS has been demonstrated to be controlled by RA-signalling . Furthermore, amphioxus Hox regulatory elements studied in mouse and chicken embryos evidenced the existence of conserved retinoic acid dependent neural elements [22, 23]. In Ciona, only an epidermal RARE element has been identified in the CiHox1 gene  and we have not found RAREs in the nervous specific regulatory regions of Ciona CiHox1-4 genes. In addition, mouse RARE elements contained in the mb1RARE and md4 fragments do not direct reporter expression in Ciona (data not shown). This is consistent with reports that Ciona embryos may have a very reduced ability to respond to retinoic acid [22, 27, 28]. In vertebrates, retinoid, FGF and Wnt signalling can all serve as posteriorizing influences to modulate Hox expression, and the relative degree to which any one or combination of these pathways contribute to Hox regulation can vary between species. Therefore, it will be important to assess the degree to which inputs from these three pathways may be implicated in regulating initial Hox expression in Ciona, amphioxus and vertebrates. Despite the differences in activation of Hox expression, our analyses indicate that auto- and cross-regulatory inputs from Hox genes themselves is a conserved mechanism for maintaining patterns of Hox expression only in Ciona but not in amphioxus embryos. Regulatory regions from CiHox1 and CiHox3, which recapitulate endogenous Ciona expression, serve as Hox response elements. The Ciona CiHox1 (1UP1.4) and CiHox3 (1CiHox3) regulatory sequences when tested in mouse and chicken embryos generate reporter expression in rhombomere 4 in a manner similar to the mouse mb1, mb2 and ma2 enhancers (Table 1). These three mouse enhancers have been shown to serve as Hox response elements dependent upon the binding of Hox/Pbx and Meis complexes. Furthermore, when the mouse mb1 enhancer is tested in Ciona it directs reporter expression in a pattern similar to endogenous CiHox1 expression (Figures 6A, B). We experimentally demonstrated that Ciona 1UP1.4 expression is under the control of Hoxb1/Pbx regulatory complexes (Figures 7A, B). Furthermore, in silico comparison of the Ciona sequences reveals multiple Hox/Pbx/Meis binding sites, similar to those found in the r4 specific regulatory elements from mouse (Table 3). As control, we also analysed the other mouse enhancers tested in this study that do not contain functional Hox/Pbx binding sites and the Ciona elements that are not expressed in rhombomere 4 (grey background). Together, these data underscore the important and conserved role that auto and cross-regulation plays in regulating Hox expression in the Ciona nervous system. Since Hox proteins can serve to both activate and repress activity, such Hox response elements might be integrating inputs from multiple Hox genes to maintain their restricted patterns following initial activation by different upstream factors. Most of the amphioxus Hox1-3 regulatory sequences tested in Ciona embryos did not work at all. The 2B fragment, the only one active in Ciona embryos, directed expression in the anterior CNS but not in a manner reminiscent of a segment specific profile that is typical of Hox/Pbx regulatory complexes. These amphioxus elements have also been tested in vertebrates, but again, none of them was able to direct any r4 or segment specific expression in chicken or mouse embryos . Despite the lacking of specific experiments with amphioxus Hox1-3 elements and Hox/Pbx complexes, considering the evolutionary position of cephalochordates at the base of chordate origin, these results seem to indicate that this auto and cross-regulatory mechanism is not present in cephalochordates and thus appeared later in evolution after their divergence but before the appearance of urochordates. Among all the Hox genomic fragments tested by electroporation it is evident that the Ciona 1UP1.4, 2D0.8, 4UP1.3, 1CiHox3 and mouse mb1 genomic fragments contain regulatory elements specifically active in the CNS of Ciona embryos at level of the sensory vesicle or of its precursors (Table 1). This expression is not specific to any Ciona Hox gene and illustrates the presence of multiple elements interspersed among all the anterior Ciona Hox genes and conserved up to vertebrates. The in silico analysis of these genomic fragments showed that a particular Pax6 binding site is present in all these sequences. All the other Ciona and mouse fragments that fail to direct reporter expression in the Ciona sensory vesicle lack this recognition sequence, suggesting that it is important for regulatory activity. Pax6 in Ciona embryos, is expressed in the sensory vesicle and in its precursors at tailbud stage  and is therefore a good candidate to explain the common expression profile of these Ciona and mouse elements. Considering that the sensory vesicle does not correspond to any Ciona Hox specific territory of expression, these elements may become active only when extracted from their natural context, suggesting that repressor elements in the genes normally silence these elements. We have compared the activity of four Ciona cis-elements located near the CiHox1, CiHox2 and CiHox4 genes and of a CiHox3 element previously identified  with the amphioxus Hox1-3 elements and a series of mouse neural specific enhancers from Hox paralogous groups 1-4 which direct segmental expression in the developing hindbrain. The regulatory potential of all fragments were tested in transgenic Ciona embryos and in addition the Ciona CiHox1, CiHox2 and CiHox4 elements have been assayed in chicken embryos for their ability to be recognised by the vertebrate transcriptional machinery. We found that segment-specific neural enhancers from mouse Hox2 and Hox3 genes dependent upon Krox20 and kreisler for activity are not functional in Ciona. Using the regulatory regions functionally identified in Ciona and chicken embryos, we used sequence analyses to compare the enhancer fragments located in similar positions which generated related expression profiles. This approach revealed that some enhancers serve as Hox response elements through the action of Hox/Pbx binding motifs. Hence, these enhancers contain cis-elements able to reproduce or maintain the segmental expression patterns typical of Hox genes through cross- and auto-regulatory influences of the Hox proteins themselves. This component of Hox regulation has been conserved during chordate evolution and the functional activity reveals that the cis-elements are recognized by the regulatory components and mechanisms of different and extant species. In summary, our study together with previous studies on chordate retinoic acid dependent regulatory regions [22–24, 29] suggests that, during Hox cluster evolution, retinoic acid responsive elements were already present in the basal chordate ancestor. They have been maintained from amphioxus to vertebrate [22, 24] but extremely reduced and restricted to epidermal tissues in urochordates [22, 29]. Auto- and cross-regulatory elements, that direct segment specific expression in the CNS under the control of Hox/Pbx and Prep/Meis complexes seem to be not present in amphioxus and may have appeared later with urochordates. These have then been conserved in vertebrates, although accompanied with extensive rearrangements and modifications. Finally, the Krox20 and Kerisler/Mafb responsive elements responsible for early Hox gene activation and for highly specific and coordinated expression in vertebrate hindbrain seem to have evolved along the chordate lineage after urochordates divergence. Ciona intestinalis adults were collected in the Bay of Naples and cultured by the Marine Resources for Research Service of the Stazione Zoologica. Embryos were raised in filtered sea water at 16°-18°C and samples at appropriate stages of development were fixed for whole mount in situ hybridization in 4% paraformaldehyde and dehydrated in ethanol series. Ascidians are non-vertebrate chordate animals and according to the European committement their manipulation does not need any ethic committee approval. All experimental work involving vertebrate animals was performed according to a project and procedures # 2010-0062 approved by the Stowers Institute Animal Care and Usa Committee (IACUC). The basic electroporation vectors were pBlueScript II KS containing the lacZ and SV40 polyadenylation sequences downstream of the human β-globin or the CiHox3 0.2 basal promoters . The CiHox1 genomic fragments 1UP2.4, 1intro3.6 and 1D1.7 were amplified by PCR using as template the cosmid clone MPMGc119H2170 isolated from a cosmid library prepared by the Reference Library Database . The fragments 1UP2.1 and 1UP3.0 were obtained by digestion from the same cosmid clone by using the XbaI-SmaI and EcoRI-HindIII restriction enzymes respectively. The genomic fragments 2UP4.2 and 2D3.1 were obtained by digestion of the cosmid clones MPMGc119C0437 and MPMGc119L0224. The fragments 2UP2.2 and 2D1.4 were amplified by PCR from the same cosmid clones. Among the genomic fragments of CiHox4 gene, only the 4UP 3.4 and the 4D2.7 were obtained by digestion of the cosmid clones MPMGc119D1338 and MPMGc119B114 respectively. All the other fragments, 4UP2.1, 4D1.2, 4D3.4 and 4D3.7, were amplified by PCR using the same cosmid clones as template. All the deleted fragments were obtained by digestion or PCR amplification of the corresponding larger fragments. All the constructs have been controlled by sequence analysis prior to use. Further information on the constructs and the oligonucleotide sequences used for PCR amplifications are available upon request. All the mouse genomic fragments corresponding to: the EcoRI-HaeIII insert of construct #15  and the EcoRV-HindIII insert of construct #9  of the Hoxb1 gene; the BglII insert of construct #1 of the Hoxa2 gene ; the BamHI-EcoRI insert of 2.1 kb of the Hoxb2 gene ; the EcoRV-AvaII insert of construct #1 of the Hoxa3 gene; the insert of construct #16 of the Hoxd4 gene , were cloned in the basic electroporation vectors described in "preparation of Ciona constructs". The amphioxus genomic fragments corresponding to the 1A, 1B, 2A, 2B, 2C, 3A and 3B constructs  were prepared as described for the mouse fragments. As for the Ciona constructs also all the mouse and amphioxus constructs have been controlled by sequence analysis prior to use. All the constructs purified on CsCl gradient were electroporated into dechorionated and fertilized Ciona eggs and assayed for LacZ expression as described . Each construct has been assayed at least five times in separated experiments and hundreds of Ciona embryos have been analysed in each experiment. LacZ staining has been considered specific when reproducing always the same pattern in at least 80% of positive embryos while has been considered unspecific when the expression was so variable that it was not possible to define its extension in a given territory. LacZ expression that did not reproduce endogenous gene expression has been termed ectopic. In all the diagrams the double plus indicates a signal that appears in less than 24 hours of β-galactosidase staining, while the single plus indicates a signal visible after more than 24 hours. The Ciona CiHox3 0.2 basal promoter sequence is not able alone to activate any LacZ expression. The human β-globin basal promoter activates ectopic LacZ expression only in the mesenchyme. Gelatin embedded sections were performed as described . Embryos and sections were photographed by using a Zeiss AxioImager M1 microscope. In ovo electroporation of chicken embryos was performed as previously described  and . Plasmid DNA, prepared from BGZ40  containing Ciona fragments, was co-injected with Fast Green and CMV-GFP control plasmid (2.5 μg/ul) into the neural tube of Hamburger-Hamilton (HH) stage 4 or 8-10 chicken embryos. Embryos were electroporated with DNA, allowed to develop in ovo for an additional 18-20 hours, and viewed under a fluorescent dissecting microscope to screen for GFP expression, indicating successful electroporation and expression. Embryos showing GFP expression were stained for β-galactosidase activity. Co-electroporations were performed as described above with the Hoxb1 expression vector added at a final concentration of 2.5 μg/μl. The mouse mb1 region was used as a positive control for these experiments . The CiHox1, CiHox4 and Stac cDNA clones were from the Ciona gene collection of the Ghost Database, ID: citb014p24, ciad029a11 and ciad017p01 respectively . Whole mount in situ hybridizations were performed as described . We analysed the potential binding sites for transcription factors using the Match tool . Match uses a library of mononucleotide weight matrices from the database TRANSFAC 11.4 professional . We used the cut-off to minimize the error rates of both the false positive and false negative matches. To do so, the software computes the number of matches found in promoter sequences for each matrix using a cut-off allowing 10% of false negative matches (minFN10). This number is defined as 100% of false positives. The sum of corresponding percentages for false positives and false negatives is then computed for every cut-off ranging from minFN10 to minFP. We refer to the cut-off that gives the minimum sum as minSum cut-off. The analyses were performed using an "in house" software developed by the CAB group  of the University of Naples "Federico II". The software permits the reconciliation of the results from the Match tools and the detection of common binding sites among sequences. Alfonso Natale, Carrie Sims contributed equally to this work. We would like to thank Francesco Maione and Francesca Russo for participation in constructs preparation. We thank the Molecular Biology Service of the Stazione Zoologica for sequences, oligonucleotides and other technical support. Part of this work was support by research funds from the Stowers Institute for Medical Research awarded to Robb Krumlauf. AN, AM and ED prepared all the Ciona constructs and AN also performed the electroporation experiments in Ciona embryos. CS performed all the experiments in chicken embryos and MLC was responsible for the in silico analyses. MB and LF discussed the results, RK directed the studies in chicken embryos and supervised manuscript organization and revision, AL coordinated the project and wrote the manuscript. All authors read and approved the final manuscript.